Notes: Right ascension and declination are for J2000. Distance and mass figures are highly uncertain. Black hole circumference figures are derived from mass estimates and are also highly uncertain. Listed candidates are of varying credibility. Thanks to Chris Anderson (College of Southern Idaho) for contributing information. 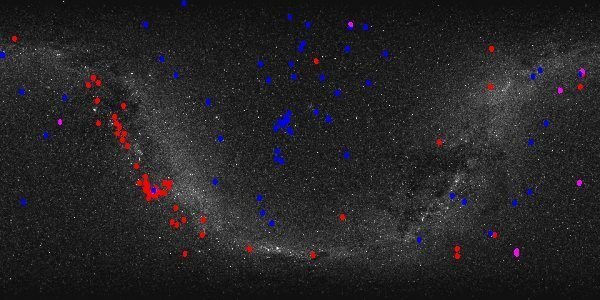 Map of sky locations of black hole candidates: stellar-mass black holes in red, intermediate-mass black holes in purple, supermassive black holes in blue. Base image: Tycho sky map from JPL's Solar System Simulator. © 2001-2003, 2004 by Wm. Robert Johnston. Last modified 30 January 2004. Return to Home. Return to Black holes. Return to Relativistic physics. Return to Astronomy and space.